Before reading any further, take a moment to soak in the statement captured in the image above. In some ways, that picture+insight could simply exist as a blog post on its own, without any need for elaboration. But writers just can’t resist. My own trajectory as a writer — and specifically, an author whose writings should reflect a growing Christ-likeness — traces back to my college days at Providence, and a series of articles I had written in our local college paper (the year before I became editor). Slapped me up-side the head. Or, in general, got my attention and made me stop and reconsider my approach. The letter itself (which was published for everyone at Prov to see and ponder) was direct and well-crafted — the writer would later enjoy a successful career in broadcast journalism, so it was no surprise that his short screed would be an excellent example of concise communication. In short, he had no problem with the content of my articles. However, he nailed my hide to the wall over my attitude and tone of writing. As well he should have. I still have copies of those articles in a box somewhere, and my “passionate” writings sure sound like a “resounding gong or a clanging cymbal” (1 Cor. 13:1), in the sober and objective clarity that hindsight provides. The sharp rebuttal that I had instinctively begun to craft in my mind, when I first read the letter to the editor, fortunately died a quick and merciful death. I was forced to confront the “why” behind my writing — and realized that my sarcastic, ranting approach was the complete and total antithesis of what I really wanted to accomplish. I am still passionate about what I write. I have zero desire to publish Christian books just for the sake of writing more Christian books. I hope I will always write from a place of passion and zeal. 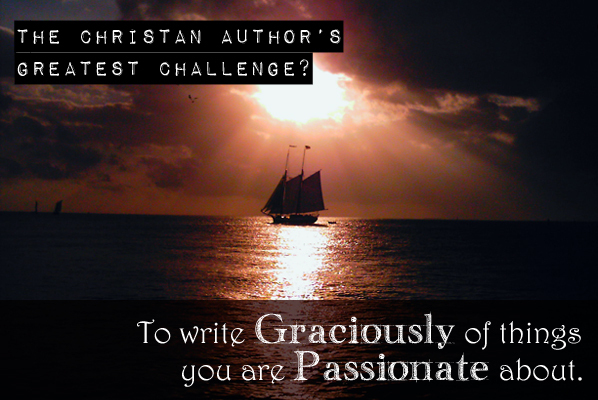 And therein lies my greatest challenge: to write graciously of things that I am passionate about. The Younger & the Elder (and their supporting cast of characters in The Genesis Café), as well as the fictitious members of ‘Charismatics Anonymous’ in Post-Charismatic, have been a great help to me in this regard. Creating characters who interact respectfully with each other is a powerful tool in meeting the challenge. Salvation has always included the assumption of ongoing discipleship. And discipleship has always included the assumption that all areas of our lives will come increasingly under the Lordship of Jesus Christ. Personal morality, business ethics and practices, our approach to justice issues — everything is (and should be) impacted by the simple yet profound statement: “Jesus is Lord”. Including not just what we write about, but how we write it.